Fido left a present on your leather sofa, unfortunately, one you could do without. When dog poop ends up on your furniture, tackle the problem as soon as possible to keep the stain from spreading to other areas on the sofa. 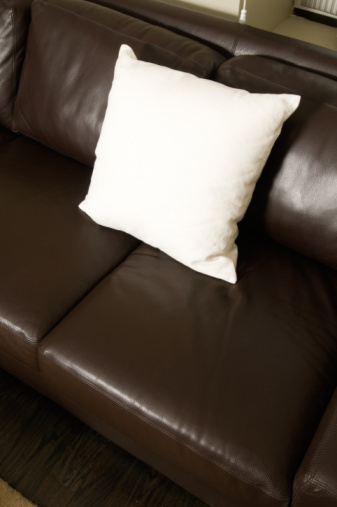 Since leather does not handle wet washing well, use leather-safe cleaning products to remove the poop stain without damaging the sofa. Remove dog poop from leather sofas as soon as possible. Tear off two sheets of paper towels. Gently scoop as much of the dog poop from the leather sofa without spreading it. Dispose of the paper towels in an outside trash can. Mix 1 tbsp. lemon juice and 1 tbsp. cream of tartar in a bowl. Spread the mixture over the stain, covering it completely. Leave the mixture on the stain for 10 minutes, then add another layer of the cleaning solution. Wet a sponge and squeeze out excess water. Blot the cleaning solution from the leather sofa. Continue blotting and rinsing the sponge until the paste is lifted. Wipe toothpaste -- paste, not gel -- onto the sofa if the poop stain remains. Wait five minutes, then remove the toothpaste with a damp sponge. Dry the previously stained area with a clean cloth. 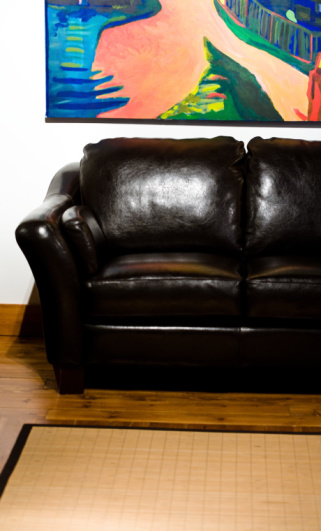 Spray a leather conditioner over the area and allow it to soak into the leather for two minutes. Wipe excess conditioner from the sofa with a clean cloth.